Webpage created: July 03, 2017. 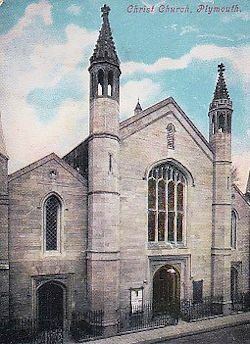 The Anglican Christ Church was situated in Eton Place, North Road, Plymouth. Part of the site is now occupied by Gloucester Court. The foundation stone was laid on Wednesday April 24th 1844. Promptly at 2pm the vicar, the Reverend John Hatchard, gave the opening Prayer and then gave some details of the history of the project. His family had started the subscriptions and amongst the wide variety of donors were Her Majesty Queen Victoria, the former vicar of Charles Church, and a female servant. He had even been accosted by a gentleman whose appearance suggested he was about to solicit relief but who presented him with five new sovereigns. As a result of such generosity, he had raised £4,908 13s 2d of the £6,000 needed to complete the erection of the Church. The ecclesiastical parish was formed on August 14th 1847 from Saint Andrew's. Built of stone in the Perpendicular style, it was fitted with pews and galleries to seat 1,085 people. It was consecrated on April 24th 1846. The architect was Mr Wightwick. It consists of a clerestoried nave, aisles, west porch and a belfry containing one bell. In 1885 the organ was brought down from the west gallery and divided so as to form the two sides of a chancel. An oak chancel screen was added in 1894. The west end was struck by lightening in 1912, when the upper parts of the west end turrets were removed and a cross erected over the centre gable end. Mr W H May was the architect of the altered west front. The apartment blocks of Gloucester Court now stand on the site of the Churcu.